Blog / ​How Many Solar Panels Will I Need to Power My Home? When thinking about installing solar panels on your home, one of the first things you need to find out is how many solar panels your home will need to generate the power you require. First, you’ll need to decide what your goals are. Do you want to leave a smaller carbon footprint? Do you want to increase the value of your home and maximize your return on investment? Save as much as possible? In general, most people thinking about installing solar power want to do all three. Then, you’ll need to answer a few questions about your home. How much energy does your home use? Does your roof have enough usable surface area? What is the wattage and efficiency of the solar panels you’re considering? How Many Watts Do You Use? To find out how many watts you use on a regular basis, you’ll need to do a little math. Check your average usage on your power bill. To find this, look for Kilowatt Hours Used, KWH Used, or something similar. Another way to find out how many watts you use is to check your bill for beginning and ending meter readings. Subtract the previous reading from your most recent reading. However, you’ll want hourly and daily usage. If your bill doesn’t note the daily average, divide the annual or monthly average by either 365 (annual) or 30 days (monthly) and then divide those numbers by 24 to find your hourly average electricity use. Your answer will be in kilowatt hours (kWh). As an example, a small house in a fairly mild climate might use about 500 kWh per month. A bigger home in warmer climates where the air conditioner is often used more might use as much as 2,000 kWh or more. On average, homes in the U.S. use approximately 900 kWh a month. The number you got above for your average daily energy use is the number you need to determine how many solar panels you will need to supply your home with electricity. It is the number of kilowatt hours your solar system will need to produce to cover all of your energy needs, though it may make the most sense to start with a smaller offset number. It’s important to understand that weather conditions can affect how solar panels operate. There may be some conditions under which your solar panel system’s efficiency will be temporarily reduced. Remember, the goal of your solar energy system is to offset your energy usage over an entire year, not any given day, week, or month. There will be peaks and valleys because of seasonality. Of course, you don’t have to do all that math if you don’t want to. Just contact a solar expert at POWERHOME Solar to see if solar is right for you. How Much Sunlight Does Your Area Receive? How many peak sunlight hours your area receives on a regular basis will affect the amount of energy your solar panel system produces. For example, if you live in North Carolina, you can expect to have more hours of peak sunlight than in Ohio. This doesn’t mean that an Ohio homeowner can’t switch to solar power, but it may affect the number of panels they will need to meet their energy needs. Check out how many peak sunlight hours your area gets by state. To convert your hourly power generation into watt, multiply the number you got for your hourly usage by 1,000. Multiply this number by the number of peak sunlight hours you get in your area each day. For example, if our average U.S. home that uses 900 kWh a month is in an area with five peak hours of sun a day, it would need 6,250 watts to fill all its needs. 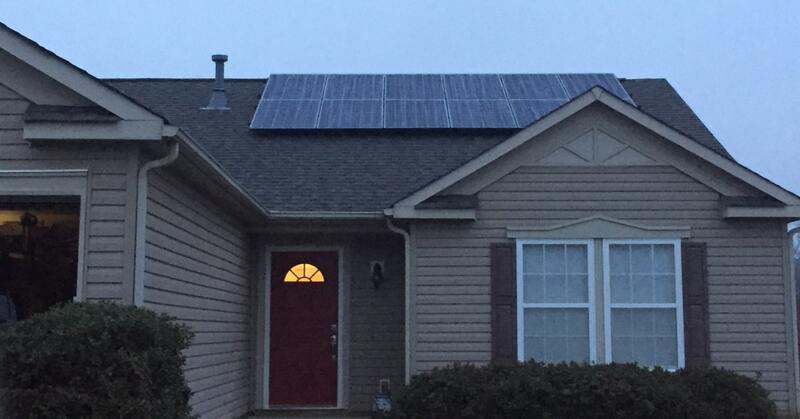 But remember, you don’t need to offset 100 percent of your power bill to go solar. You can choose the percentage of offset that’s right for you and your home in light of other factors such as the following. What about solar panel size? If you have an unusually shaped or very small roof, solar panel size may be an issue. With a large roof area that gets plenty of sunlight, you should be able to use the typical residential solar panel size of approximately 65 inches by 40 inches. Although there are some variations in the industry, most solar panels are about this size. And the great thing is, solar panel efficiency has never been better. Knowing the answers to the questions above will help you determine how many solar panels your home most likely will need to meet your energy needs. Next, talk to a professional at POWERHOME Solar to find out how much you can save with solar energy. Fill out the form below or contact us at 800-765-2715, and one of our solar representatives will help you determine what is the best solar panel installation for your needs.